(Sheffield, U.K.) After coming off a 1-1 effort on Monday, the Canadian Senior Women’s National Team looked to get their second win of the 2018 Continental Clash against a strong German team. A solid effort from the Canadian side fell just short, as Germany completed a comeback to take the game 63-60. Following a slow start in the first five minutes of action, Team Canada regained momentum and kept Germany within a three-point lead by the end of the first quarter. Canada then erupted for a 22-10 run in the second quarter, going into the half with a commanding 37-28 lead. Canada kept the lead throughout the third quarter although Germany was able to bring the score within five points. While Team Canada utilized its speed to convert on good fast break opportunities, Germany’s significant size advantage neutralized the Canadian lead. The Germans kept hitting shot after shot in the final period, finishing the game with a dominant 56 per cent shooting effort from the field. Germany pulled ahead in the last stretch of the game on a 9-0 run, edging the Canadian team 15-7 in the final 10 minutes to take the win 63-60. Arinn Young scored a game-high 23 points on 61 per cent shooting from the field while Maude Jacques led all players coming off the bench with a 14-point performance. Young also led the Canadian team with 8 assists and 8 rebounds, nearly notching a triple-double. The Canadian bench also soared for 28 of the total team points compared to Germany’s 11 bench points. Mareike Miller led the German squad with a team-high 18 points and 10 rebounds, shooting an efficient 89 per cent from the field. The Canadian Senior Women’s National Team next play on Wednesday at 7:30 p.m. BST (2:30 p.m. EDT) against the hosts, Great Britain. On the men’s side, the Canadian Senior Men’s National Team played their second game Tuesday at 7:30 p.m. BST (2:30 p.m. EDT) against Poland, winning 71-61. Team Canada came out scoring early with great vision from Captain Bo Hedges and Patrick Anderson freeing up scoring opportunities. However, Poland quickly responded, going on a 6-2 run to gain the lead for the first time in the game. Following a time out, Anderson scored two in a row to give Canada back the lead. At the end of the first, Canada was up 16-15. Ben Moronchuk came off the bench in the second quarter, scoring 14 points in ten minutes while notching a couple of assists to spark some Canadian offense. After a couple defensive stops and a quarter-back like assist from Anderson to Moronchuk, Canada went up 31-25 midway through the quarter. 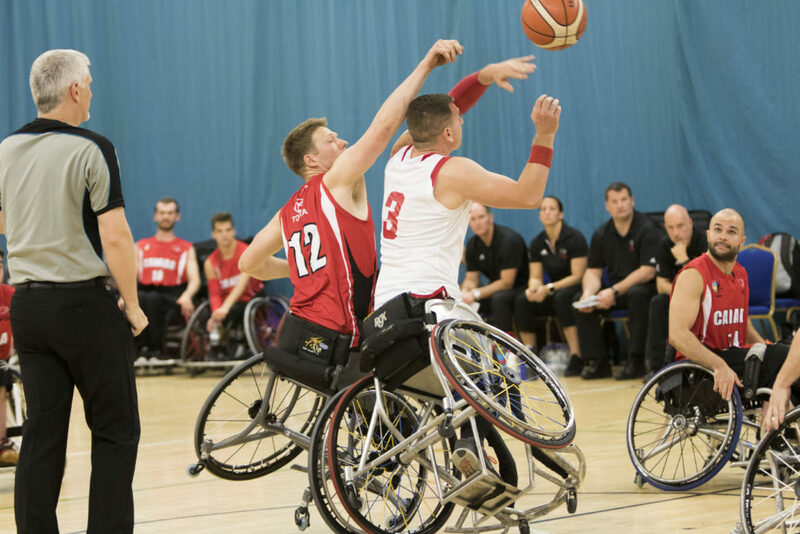 Colin Higgins also added to Canada’s momentum, finishing with seven points and three rebounds through two quarters to give Canada a 35-34 lead at the half. Poland opened second half scoring, but a great feed from Anderson to Higgins that resulted in an and-one put Canada back in front. Both teams got more physical in the third quarter with fouls being called at either ends of the court. The score stayed tight with Canada holding on to a one-point lead at the end of the quarter. Moronchuk came off the bench again to start the fourth quarter, immediately converting on offense for Canada on a fast break. Another basket by Anderson and a back-door look from Moronchuk gave Canada the largest lead since the second quarter. Following a Poland time-out, Anderson launched a baseball pass to Hedges downcourt to extend the lead. Poland push hard late in the quarter, but Canada dominated the final 10 minutes to take the win 71-61. Anderson finished the game with a 20-18-11 triple-double while Higgins and Hedges also score in double digits. Moronchuk scored 18 points in just 15 minutes of play. The Canadian Senior Men’s National Team next play on Wednesday at 5:30 p.m. BST (12:30 p.m. EDT) against Spain.